For more than half a century, marketers have bombarded customers with more and more choices in products and services. What is the result? Unprecedented anxiety. Our mental circuit breakers are on overload. In fact, pioneering brand strategists Steven M. Cristol and Peter Sealey assert that we have reached our manageable threshold for making decisions -- and a watershed in product proliferation. In this pathbreaking book, the authors argue with compelling evidence that the next generation of marketing successes will belong to those brands that simplify customers' lives or businesses in ways that are inextricably tied to brand and product positioning. They contend that if a brand is not reducing customer stress, it is creating it -- and it is vulnerable to losing market share to more customer-empathetic competitors. 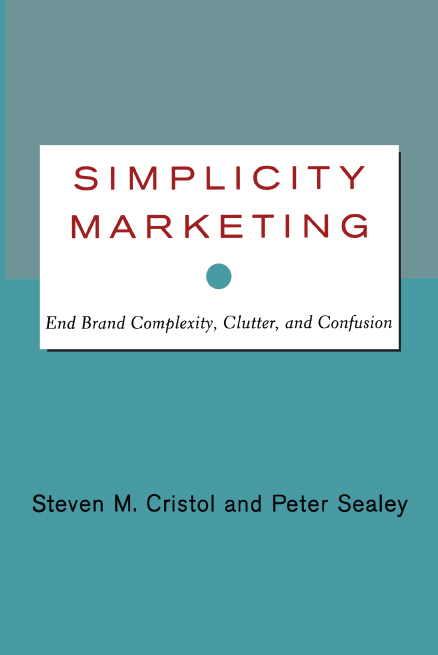 Writing especially for product or brand managers who are struggling to simplify their portfolios, Cristol and Sealey have created a breakthrough framework that is itself a lesson in simplicity. After presenting two essential guideposts for managers to assess where their brand sits on the stress spectrum, the authors turn to the heart of Simplicity Marketing -- the 4 R's of simplification: Replace, Repackage, Reposition, and Replenish. Using scores of real-world company examples, Cristol and Sealey show how each of the 4 R's interacts with the others in powerful ways to relieve customer stress and how these strategies may be executed individually or in combination to build brand loyalty. Here for the first time are ten specific strategies to relieve customer stress through consolidating, aggregating, or integrating products and services, repositioning brands for more relevance to stress reduction, and decluttering customers' decision-making requirements. The final pages of this brilliant manifesto for a simplicity revolution provide a guide to managing simplicity strategies, leveraging information technology to simplify rather than complicate customers' lives, and integrating all the tools in the book into an executional blueprint. In the three short decades between now and the twenty-first century, millions of ordinary, psychologically normal people will face an abrupt collision with the future. Developed economies were largely built on proliferation of choices. The notion of "more is better" became genetic code among twentieth-century consumers growing up in these economies. Now, with each passing day, more and more of these same consumers find that they have run headlong into a wall. The wall is their manageable threshold for the sheer number of decisions they are being asked to make, and they are throwing their hands up in despair. But in this frustration is a win-win opportunity to de-stress customers and, in so doing, to build brand equity and shareholder value. How did we get to a consumer world of 40,000 products in a supermarket, hundreds of long distance and cellular calling plans, 52 versions of Crest toothpaste, magazine ads that show 37 available configurations of a Dodge Caravan on a single page, and the distribution of a thousand coupons per human being each year in the United States? How did we get to a business world confronted by more than 200 different brands of conference room chairs, 225 different models of mobile phone handsets, and 100-plus brands of desktop and laptop computers -- all marketing for mindshare above the daily din of the purchasing manager's voice mail and e-mail messages? Can the human brain sustain its ability to cope with such overwhelming choice in an age of a networked economy, higher productivity expectations, and shrinking leisure time? Is the resulting level of customer stress really such a big deal? To glimpse how radically purchase decisions have changed since publication of Alvin Toffler's seminal Future Shock in 1970, one only needs to peer into the digital-age lives of two people who could be your customers. Meet John Braxton and Lucy Chavez. John is a middle manager in a Fortune 500 company, the father of first- and fourth-grade children, and the husband of a real estate broker who works long hours. (John's wife is among the ranks of 75% of U.S. wives under age 65 who work -- compared to less than 40% in 1970.) Lucy is a thirty-something superstar director of information systems at one of the world's largest banks; her career has been all-consuming, and she hasn't yet had time for marriage or family (though lately she's been all too aware of the ticking of her biological clock). Note that neither John nor Lucy, though technologically savvy, are bleeding-edge early adopters of new technologies in their personal lives. Like so many readers of this book, they are users of mainstream digital-age technologies like voice mail, cell phones, e-mail, and the Internet, but have not yet plunged deeply into the post-PC world of information appliances. So as you read about their day, remember that still awaiting them in the short-term future is the prospect of learning about and sorting through the burgeoning milieu of home computer networks, digital VCRs, portable Internet music players, wireless Web tablets, wristwatch phones, "smart" picture frames, networked washing machines, personal portable bar code scanners, and the next generation of handheld organizers. Forgetting for a moment that the post-PC world will bring even more clutter and confusion into the picture, let's first look in on John's day. Before leaving the office, John picks up a voice message from his wife asking him to stop at the supermarket to pick up a few simple items to get the family through to the weekend: orange juice, bagels, Philadelphia cream cheese, Crest toothpaste, Coke, and some fresh lettuce for salads. John enters a Safeway supermarket on his way home; it contains about 37,000 different products with distinct SKUs (stockkeeping units). Inside the store, his little 2-inch Post-It Note-size shopping list becomes a 25-minute obstacle course as it explodes into more than 250 choices for only those six items on his list. (In 1970, the same six items combined offered just over 50 choices. The average supermarket contained only about 8,000 SKUs; the approximate number of new grocery product introductions in the United States was 800 in 1970, compared to more than 11,000 in 1998.) Table 1.1 shows a comparison of what John sees this evening, compared to what might have been a typical 1970 selection. John finally gets to the checkout counter, only to be asked, "Do you have your Safeway Club card? Do you want paper or plastic bags this evening? Credit card or debit card?" When the kids are finally in bed, John and his wife decide to unwind by vegging out in front of the TV for a little while. John flips on the remote to see the TV Guide Channel's scrolling list of what's on -- on the nearly 300 channels they now get via digital cable. After using up 10 minutes of TV watching time just to sort through some of the choices, John sees that the year's first Monday night football game is on. But his wife thinks that the 1,050 hours of football programming available on ESPN alone this season (not counting the previously broadcast games on ESPN Classic) should provide enough choices for John without her having to watch a game on a work night. (After all, the traditional fall football "season" we faintly recall from 1970 now stretches to six months from early-August preseason opener to the early-February Pro Bowl, overlapping with the extended seasons and expanding leagues of other professional sports to create exponentially more event choices in any given week than ever before.) So John's wife opts instead for a CBS special on stress reduction. During that hour of prime time, 47 commercial/nonprogram messages run -- not including a one-second commercial for Master Locks -- the broadcast equivalent of the banana sticker micro-ads mentioned earlier. (In 1970, there were four TV channels in the average U.S. market. Today's fragmentation of programming explains why Seinfeld, the top-rated sitcom of the '90s, drew only one-third the audience of The Beverly Hillbillies, a top-rated sitcom of the '60s. The average number of commercials in a 1970 prime time hour was 16, less than half of today's number.) Forty minutes later, John has fallen asleep sitting up. We will spare you the rest of Lucy's day, which is not yet even one-third over. You get the idea without suffering the details of her hectic afternoon and her late evening return to her high-tech condominium. After all, her day probably wasn't that much different than yours. Ironically, the people of the future may suffer not from an absence of choice, but from a paralyzing surfeit of it. They may turn out to be the victims of that peculiar super-industrial dilemma: overchoice. Just how bad is it? In the world's most advanced economies, stress levels ushering in the millennium are staggering. Studies in the '90s showed that 65 to 90% of all American visits to physicians are stress-related. Is it really that much worse now than just 30 years ago? During the first two decades of Monitor, the ongoing consumer research study by Yankelovich Partners that is the longest-running annual survey of American psychographics (launched, coincidentally, in 1970), stress was an also-ran on the list of American preoccupations and concerns. But by the '90s, it was at the top -- dubbed "the number one ?thorn' that consumers are trying to remove" in a recent Yankelovich report. Around the same time, chair massages started popping up everywhere from airports to outdoor festivals. Meanwhile, the day-to-day complications of customers' lives were occurring against an increasingly dynamic backdrop, where not just technology was spiraling ahead at a dizzying pace, but the very fundamentals that define the world around us were destabilizing. Even maps of the world changed dramatically since 1970 as the number of nations in the United Nations mushroomed from 144 to 185 by 1998. By today's standards, in 1970 telemarketing calls interrupting dinner were rare; by 1999, more than 20 million telemarketing sales calls poured into U.S. homes each day, and the average U.S. household was receiving about 150 pieces of mail a month (far more in affluent Zip codes) to add to the 18 pieces already received at the office each day by the average worker. For homeowners, those calls and mail are coming into houses averaging 2,000 square feet that are almost twice as large as in 1970 (and twice as much to take care of and fill up with stuff). During the '90s, the simplicity movement in general and the voluntary simplicity movement in particular became a groundswell of determination to reverse the direction of "more is better." An increasing number of middle- and upper-middle-class people began to look at moderating consumption and reducing both physical and emotional clutter as strategies for relieving stress and improving quality of life. The first week of August became Simplify Your Life Week and, by 1995, surveys were showing that 60 to 80% of working people would take a pay cut to be able to work fewer hours. A spate of similarly themed books suddenly crowded the shelves, ironically even pushing the threshold of overchoice on simplicity books (consider Larry Roth's The Simple Life, Deborah Deford's The Simpler Life, and Elaine St. James' Living the Simple Life and Simplify Your Life -- all published or rereleased within the one-year period ending July 1998, and all selling in spite of the confusion because people were sufficiently desperate for relief). Customers certainly don't have to be actively involved in the simplicity movement for stress to manifest in their shopping behavior. Just look at "cross-shopping" -- the phenomenon of more and more upscale consumers shopping at discount stores such as Target. In spite of a strong economy and negligible inflation, a 1998 survey by WSL Strategic Retail found that 90% of U.S. shoppers with household incomes exceeding $70,000 shop in discount stores -- twice as many as five years before. In reporting on this survey, The New York Times cited the Vanilla Candle Syndrome: "Tired overworked shoppers prefer to save their paychecks for bigger thrills like vacations and massages than to spend them on baby clothes and placemats; and if they cannot afford the vacation or the massage, they go for a scented candle instead." Meanwhile, the enormous popularity of video games -- an industry whose revenue surpassed that of movie theater box offices during the '90s -- is increasingly due to the need for stress relief. In recent consumer research asking men why they play video games, gamers in their 20s and 30s cited key reasons as "relieving the stress of my workday" and "it relaxes me and helps me unwind." Why did we subject you to John's and Lucy's daily war? In a word, empathy. Can you honestly say as a marketer that you have fully taken into account such scenarios -- even though you're likely living some variation of them yourself -- when planning the next battery of customer choices that you will thrust into the marketplace? If so, congratulations! You're in the minority, as many marketers either haven't heard customers' cries for help or have underreacted in adjusting their product development and marketing philosophies. Most of us in this hurry-up, e-mail world of instant response are feeling the same sense of overload....Indeed, the primary challenge of successful human life in the postmodern millennial world is the challenge of too much: too much to do; too much to cope with; too much distraction; too much noise; too much demanding our attention; or, for many of us, too many opportunities and too many choices. Too much of everything for the time and energy available. We all have been feeling, at least on a subliminal level, the choices, demands and complexities of life increase with every passing year. We have more to be, more to do, more places to go, and more things we want or need to accomplish. But the day remains twenty-four hours; the year, the same twelve months. The amount of activity constantly increases, but both the amount of time into which it must fit and the human energy with which it must be met, at best, remain the same. Commerce is just one contributor to these feelings -- and to the cluttered, burdened psyches to which you are trying to market. Too much choice in commerce is compounded by proliferating choice in noncommercial arenas. Consider just two cornerstones of life in an evolved democracy: schools and elections. In the United States only about 4% of parents sent their kids to private schools in 1970. Usually, the neighborhood school (or a designated school across town where forced busing programs were in effect) was the obvious and only choice. No decision was involved. Today, parents are nearly four times more likely to send their kids to private schools, choosing among as many as two dozen different schools in a metropolitan area -- and first having to decide between secular versus religious, co-ed versus not, how far they are willing to commute, and whether to choose a primary school that goes all the way through high school (or at least middle school) versus only through fifth grade. Meanwhile, even those in the public school system may have to decide whether to apply to an "alternative" public school, get on the waiting list for one of the better public schools outside the neighborhood, or apply for an accelerated program school for a smarter child. If it were just the once-in-a-while noncommercial choices like schools and elections adding to the commercial clutter, we would probably be managing better -- but it's also the countless little day-to-day things. More than 300 million Western Europeans must muddle through the unsettling daily challenge of putting aside the currencies they grew up with, adjusting to living and working with, and thinking in terms of, a new monetary unit. As the most developed economies attract more and more language-dependent immigrants, ever larger sectors of the consumer populations in countries like the United States face the daily stress of transactions and buying decisions outside the comfort of their native languages. Meanwhile, it appears that within the next dozen years the United States will run out of 10-digit telephone numbers -- resulting in the need to change all numbers to perhaps 14 digits (e.g., a 5-digit area code and 9-digit number) and, along with that, structurally as well as numerically change countless databases and software applications that involve the use of phone numbers. With such mind-numbing data intake woven into the fabric of each day, it's almost unspeakable to contemplate the 15,000 channels that may become available to a single TV set via satellite technology. So it isn't just commerce that's stealing time. But the noncommercial clutter certainly makes conducting commerce all the more challenging for customer and marketer alike. No wonder so many Baby Boomers find themselves pining for the simplicity of their parents' lives. When of child-rearing age, their parents not only didn't have to choose a long distance company or a brand of electricity and gas or choose one of those 37 different models of Dodge Caravan but also may have never had to choose an elementary school, sort out myriad child care issues and options, or even live through a single area code split. We won't even think about the contrast of their grandparents' lives, when Coke was available in only one variety and one size (before 1955), and when the prospect of 2-liter plastic bottles of Caffeine-Free Diet Cherry Coke adding more visual clutter to the task of navigating supermarket aisles would have been questioned as perhaps unnecessary. Time is not a solitary enemy; rather, it is the alchemical stew of time and confusion -- both from commercial and noncommercial overchoice -- that simmers to produce the stressful bewilderment which new marketing strategies must address. This is further compounded by sleep deprivation since, when Americans need more time, nearly half take it out of sleep. The catalysts that convert time into stress, exacerbated by 4 out of 10 Americans admitting they are so sleepy during the day that it interferes with their activities, will be further explored in Chapter 2 as additional clues to what marketers can do to be heroes rather than villains. On one hand, more and more customers are addicted to speed and insistent on immediacy; on the other, they are desperately searching for ways to slow down or even step off the treadmill. No one likes to acknowledge their own limitations. But with the futility and frustration that would come from trying to stuff the Internet through an old 2,400 baud modem, we try to stuff ever-expanding options into a nonexpanding brain that simply wasn't bioengineered for this. Computer processor speed doubles every 18 months but, as Nobel laureate Arno Penzias points out, "Even Albert Einstein could take only 300 bits per second. No human being can take in more." Natural complexity will continue to increase with the tide of innovation, technology, and infrastructure. Without help from marketers, customers will increasingly find themselves swimming upstream. The growing gap between what we are able to take in and what we are confronted with taking in has not only emotional and physical costs but a dollar cost as well. The stress epidemic is levying a hefty stress tax on all of us -- costing industry more than $300 billion annually, or nearly $8,000 per worker, in increased health insurance outlays, absenteeism, reduced productivity, burnout, costly mistakes and accidents in the workplace, high employee turnover, poor morale, and problems in the family and with alcohol and drugs. This does not imply that when a customer contact presents a well-targeted offer of real value, it is not a valuable and welcomed service to the customer. But even valuable offers and splintering of options still contribute to the noise that in turn contributes to customer stress and overchoice. And, tragically, sometimes even life-simplifying products come along, only to sabotage themselves with complex pricing schemes, arcane short-term promotions, and less-than-clear advertising. All of this in the aggregate can add insult to injury for overstressed customers -- even for the most passionate champions of capitalism. The message for marketers is clear: Human capacity for choice is not an infinitely expandable commodity. This is as true for the purchasing vice president of a large corporation as for a housewife or househusband. But empathy for the customer's plight is still lacking. Choice must be proactively managed in the twenty-first century, and this puts contemporary marketing at a crossroads. Those who succeed will increasingly have to market new products and services as replacements for, or consolidators of, existing choices rather than merely as something new. One key to excavating stress-reducing customer solutions is the concept of a whole life context; that is, placing more emphasis on how a marketer's product category interacts with other product categories in the customer's life, and less emphasis on analyzing the category in a silo. Ostensibly, in most categories, customers continue to demand an abundance of choices. Different needs and lifestyles have naturally led to the call for products and services tailored to the individual, with more and more customization. But customers' lives are a complex quilt of hundreds of product categories that they use or are solicited about. And customers' minds are not neatly segregated into separate compartments the way marketers compartmentalize their definitions of product and service categories, sales channels, and communications vehicles. What may be good and desirable in one category compounds over many categories to create dysfunctionality for the individual customer. A central cause of this is that customers are generally interrogated by market researchers about their preferences within the confines of a single product or service category. But the customer's real life is not so neatly segregated. So while customers continue to demand choice and customization when asked about preferences within that single category, it is the exponential impact of choice in multiple categories that produces most ongoing overchoice stress. Unfortunately, the brand marketer conjures up the inevitable outcome: If you tell me you want more choice in my product category, and then you also tell my peers you want more choice in their categories, we will collectively flood you with an avalanche of decisions. The result is stress-compounding reverse synergy, where more is less as the customer tries to cope. The good news is that there are nearly endless possibilities for creative ways to reduce customer stress. Brands can play a core role in stress reduction, especially when brand managers understand and fully leverage brands as time savers and simplifiers. Overchoice backlash explains why Yankelovich Partners, based on the findings of Monitor, talked during the '90s about the emerging importance of brands as "one-think shopping." In the context of too much choice, brand becomes the shortest, most efficient path to potential satisfaction and tension release. Monitor found that brands were playing a bigger role as the exasperated consumer's simplified shortcut to a purchase decision; in essence, the prevailing thought was, "I've hit my threshold for comparing all these features; this is the company (brand) I want to do business with (based on my brand perceptions), so let's just get on with it!" Hence, one-think shopping -- the safest way to cut corners in making choices. This attitude coincided with the consumer losing faith in support systems and thus having to be more self-reliant. As Monitor continued to show waning consumer confidence in everything from travel agents to doctors to advertising, this put more pressure on making choices for one's self. So the one-think shopping that a strong brand can offer has become even more appealing as choices pile up with less reliance on third-party assessment of those choices. More than ever, strong brands are simplifiers. Weaker brands promotionally shouting for attention are not. Beyond ongoing strengthening of their brands, some leading marketers have already acted on the simplicity imperative. The mid-1990s marked the first wave of blue-chip marketers not only questioning their long-standing more-is-better momentum, but actually beginning to do something about it. IBM's PC Division was struggling in 1994, building an almost incomprehensible number of different models, racking up a billion-dollar operating loss in one year, and getting leapfrogged by Compaq for market leadership. But during the next three years, IBM slashed its number of models from 3,400 to 150, options from 750 to 350, and number of different parts in inventory from 56,000 to 15,000. By 1997, IBM's PC business was growing faster than the industry for the first time since the 1980s. Meanwhile, Procter &amp; Gamble (P&G) had already turned to simplification to begin reversing its long history of unbridled line extension and product proliferation. When P&G cut its marketing staff by 30% between 1993 and 1995, it did so as the first major packaged goods marketer to commit to weeding out unnecessary variations of products and packaging around the world. Among the first categories in which P&G decided to reduce customer choice was hair care products. Starting from a place where there were more than 30 varieties of Head &amp; Shoulders shampoo alone, P&G reduced formulas and packaging variations until the company's total number of hair care SKUs were cut by half. Less choice for consumers, yet P&G market share has increased steadily every year since. So what may have begun as a cost-cutting measure at P&G became a win-win for consumer and marketer alike. (See Chapter 10 for a more comprehensive look at P&G's Efficient Consumer Response initiative and its impact on shareholder value.) When fewer than 10% of household and personal care products account for more than 80% of sales, that's a pretty strong clue that shoppers' (and retailers') lives are unnecessarily cluttered with product variations few people really care much about. While P&G was passing out marketing staff pink slips, Burger King eliminated 27 menu items in one year. Refocusing on core products and a simpler menu ended a series of marketing missteps and was considered a key driver of the reversal of Burger King's fortunes, generating double-digit revenue growth internationally by 1997. Also during the mid-1990s, companies as diverse as Sunoco, Nabisco, and General Motors had begun reducing product variations in significant parts of their businesses, and in 1999 Unilever announced a five-year plan to slash its brand portfolio from 1,600 to 100. Still, as P&G, IBM, Wal-Mart, and Burger King led the way on simplifying, most marketers continued to crank out an unprecedented number of new products, line extensions, and complex promotions. This is somewhat understandable in rapidly evolving technology categories where product cycles are short, obsolescence is quick, and many new brands are vying for market entry, but less understandable in established, more stable categories where sophisticated brand marketers have ruled. Yet Kraft introduced 38 new cheese products in 1997 alone. The entire economy is riddled with time-wasting routines and regimes that squander much of the time of the average customer. Suffice it to say that the concept of the customer's life span as a crucially scarce resource, indeed the most precious resource of the information economy, has not penetrated to many of the business and governmental institutions....The customer who is well fed, sheltered, and capable of purchasing most of the material boons of life, the customer who grasps the possibilities of the new technologies of the speed of light, is no longer going to put up with standing in unnecessary lines, filling out gratuitous forms, (or) telling telemarketers whether he has had a nice day. This certainly pertains to after-sale service as well. As a member of United Airlines' Mileage Plus program, this author recently received an account statement in the mail that was accompanied by a 12-page newsletter, a fine-print insert about blackout dates, and no fewer than 13 separate special-offer promotional pieces from MCI, rental car companies, hotels, credit cards, and real estate services -- each with their own special restrictions and instructions. I am a member of several frequent flier programs; what if I received such a formidable, mind-numbing package every month from each of them? In the whole life context of anyone busy enough to be a frequent flier, this "loyal customer" mailing made me feel worse -- not better -- about my relationship with the United brand. It seems increasingly clear that simplifying customer decision making can help you survive the inevitable overchoice shakeout that will occur in materially rich but time-starved societies. But there are at least two good reasons why most marketers haven't been more responsive to the customer's plight. One is that, as long as there are shareholder expectations for revenue growth -- which there most always will be -- it seems antithetical to eliminate products and risk that competitors will be left to offer something that some customers may still be interested in buying. But the other reason is that reducing customer stress is a tough, complex job without much of a road map. There have been theoretical frameworks for years on how to strategically extend a product line, but how many road maps have you seen for customer stress reduction? The remainder of this book provides that road map and dissects Simplicity Marketing as a framework for effective stress relief. Chapter 2 begins by offering fundamental concepts that help you assess the degree to which you're part of the problem or part of the solution, and lays the foundation for the specific Simplicity Marketing strategies that follow. In this chapter we have brought into focus how more choices in the marketplace, against a backdrop of new technologies and rapid change, can cause a backlash of customer confusion and frustration. We looked into the daily lives of two intelligent, capable people and saw some of the challenges that overchoice can present to them as customers -- and to you as marketers. We explored how the ever-increasing flow of required decisions in choosing and using products can create stress, even for products designed to make life easier. We discussed the aggregate impact of marketing across the many product categories and brands in any one customer's life, and why sensitivity to stress in a whole life context is increasingly important to any brand trying to sell or service that customer. Finally, we glimpsed power in the simplifying role of brands as anchors in the customer's chaotic life, and described how streamlining product lines can improve business performance while bringing more clarity to the customer's world.